Australian Politics Are A Full-Contact Sport : Parallels Australia is changing prime ministers, and both the outgoing and incoming leader are from the same party. In the country's rough-and-tumble politics, Julia Gillard has lost her job to Kevin Rudd in the same manner that she captured the post three years ago. 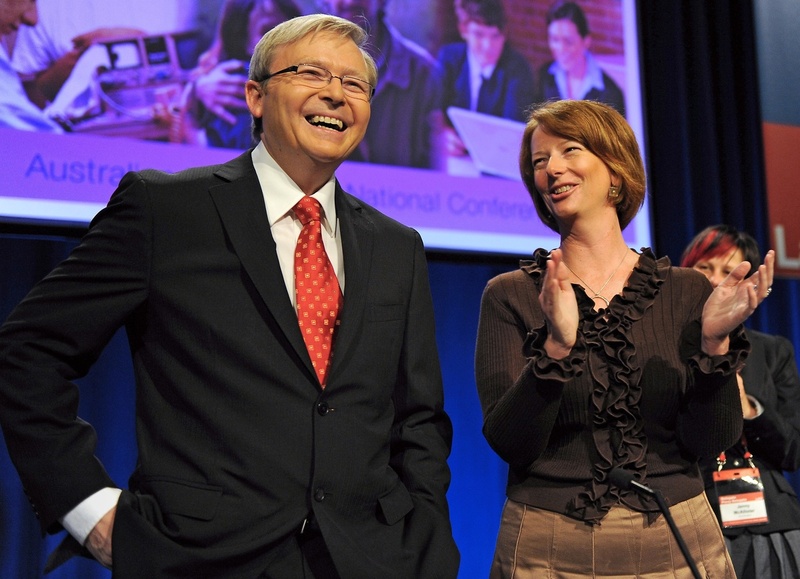 Kevin Rudd, the incoming prime minster, and Julia Gillard, the outgoing prime minister, in happier times. While Americans often lament the state of politics in Washington, spare a thought for Australians, who will wake up Thursday morning under a different prime minister than the one they went to bed with. Just as Australians were preparing for national elections in September, former Prime Minister Kevin Rudd took back the reins of power from Julia Gillard, the woman who had deposed him three years before. Gillard became Australia's first female prime minister by challenging Rudd for the leadership of the ruling Labor Party, as Rudd was floundering in the polls. It was the first time a sitting first-term prime minister had been deposed in Australia. "Knifed in the back" was how some commentators described it. Such is the system in Australia, where people don't vote directly for the prime minister but for local members of Parliament; the majority party elects its leader and thus the prime minister. The U.S. Electoral College has its critics, but at least it provides a certain amount of stability. Love him or hate him, Americans know that, barring any high crimes and misdemeanors, a sitting president will be around until the next election. In Australia, things can be a bit more abrupt and dramatic. Rudd might have been down, but he never went out. In a script Machiavelli couldn't have written better, Rudd remained in Parliament, gaining sympathy from the public over his surprise ouster and biding his time until he could once again take the reins of power. His detractors in Parliament blamed him for leaks that undermined Gillard's government, and the ever-present specter of Rudd's possible return to power was blamed for Gillard's slow decline in popularity. With an election just two months away and polls showing Labor set for a historic defeat, Rudd's opportunity for a return was at hand. Those same polls showed that if he was in charge, Labor would at least have a fighting chance at the election. And so, to paraphrase Yogi Berra, "it was déjà vu all over again." Rudd moved against Gillard in a late-night leadership challenge, and Gillard went out the same way she came in. Having broken through the glass ceiling for women in Australia, Gillard says she's now quitting the political arena. Australian politics have often been described as a full-contact sport. There is little sense of the decorum and respect usually seen in the U.S. House or Senate. While two members of Congress may wildly disagree on an issue, on the floor it's always "the gentleman from Ohio" or the "gentlewoman from California." When Rep. Joe Wilson called President Obama a liar during a 2009 speech to Congress, the rebuke by the House of Representatives was swift. But on the floor of Australia's Parliament it's not unusual for the party leaders to call each other "liars," "brain-damaged," "gutless," "vermin" ... and worse. During a fiery debate last October, Gillard labeled the leader of the opposition a misogynist. "It's just a lack of gallantry that has crept into not just politics but the way politics is reported, and I think it gives license to a type of hater that will only further reduce the quality of our lives, you know? The better politicians we have in place, the better our society is going to be, the better all of our lives are." "In recent years, politics has failed the Australian people. There has just been too much negativity all around. There has been an erosion of trust — negative, destructive personal politics has done much to bring dishonor to our Parliament but done nothing to address the urgent challenges facing our nation, our community, our families." Rudd has called for the negative politics to stop. But that comes from a master politician who is accused by Gillard's supporters of being pretty negative himself.